The May WER report updates the near term market outlook and profiles 30 floating production projects likely to evolve into major equipment contracts over the next 18 months. 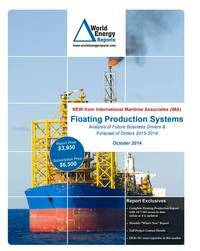 In the data sections of the report are details for 238 floater projects in the planning stage, 72 production or storage floaters now on order, 262 oil/gas floating production units and 15 floating regas units currently in service and 25 production floaters available for redeployment contracts. Charts depict the location where floating production and storage systems are being planned, operating and being built. Information is current as of 18 May.